What started off as my deciding on writing another video game hack (similar to, if not as extensive, as my Final Fantasy hack notions) has rapidly mutated into something else. I suppose I had other ideas simmering in the back of my head; whatever the cause, the items and critters contained in the document below pay lip service at best to the original source material. "My" D&D; or, oh yay a meme. "when you think about Dungeons & Dragons, the cover of what product comes first to mind?" 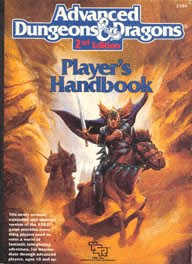 I may be happily pittering about with the Rules Cyclopedia off and on at the moment, but AD&D2 is my home and always will be -- and one of these days I'll be getting that Spelljammer campaign up and running. And my next Planescape campaign for that matter. Commonly called cave clams and dungeon oysters, jekti have slippery grey-green bodies and a row of beady red eyes encased in thick, ruffly bivalved shells the size of an ogre's head. On rare occasions a jekti may be seen slowly migrating along nearly any stony surface found in a cavern – or dungeon – but the cave clams are most commonly found clustered in colonies on walls, choking off passageways, and generally being a nuisance. Some dungeon inhabitants cultivate the clams for that very purpose. If approached, and especially if disturbed, a jekti will gape its shell and spit a hissing stream of orange-yellow acid at the interloper, inflicting 1-4 hit points of damage with a range of 10'. The acid will inflict a further hit point of damage the following round, then go inert. The bitter, caustic flesh of a jekti is not considered palatable by humans or most demihumans, but goblinoids of all stripes consider cave clams a prized treat. The molluscs collect no treasure per se; however, each jekti has a 15% chance to carry an amber-tinted “acid pearl” within its slippery mantle. Found in oases and the grasslands that make up the desert's southern reaches, the lithira is a delicate looking creature that travels in small herds and resembles an antelope in basic build. Long of limb and neck, the “pearl gazelle” sports a long plumed tail, large black eyes, and a snowy coat in addition to the plate of pearly horn that gives the creature its common name. Though this plate -– spanning the top of the skull and down the length of the muzzle -– is lovely in its own right, the lithira's true treasure lies in the smooth organic gemstone found in the skull-bone beneath. Deep ruby in the female and amethyst in the male, these “pearls” are highly valued as talismans with up to 200gp in good condition. In combat the lithira attacks with sharp forehooves, inflicting 1-4 hit points of damage per hoof. though not immune to non-magical weapons, if a lithira is struck by mundane steel it will dissolve into an insubstantial, mist-like form for a round. During this time the lithira may not be attacked at all, save by magic; the pearl gazelle will attempt to flee if possible, and any further attacks while the lithira is in mist form provoke a magical backlash against the attacker of 1-8 hit points of damage. To cheer up the poor lonely letters in the book. When this spell is cast a disk-shaped 5’-diameter portal, ringed in silvery, luminescent crystal, is created; this disk will transfer anything which passes through it to a single location of the magic-user's choice within range. The magic-user can then instantly transfer himself from his current location to the chosen location by stepping through the manifested gate; if the magic-user travels through first, the gate will collapse before any other may pass through. The magic-user always arrives at exactly the spot desired when the moongate is created. Casting this spell onto a target, the magic-user implants within that target’s mind a driving hostility against a single target or creature type (spellcasters – not recommended if you're still in reach! – orcs, dragons, etc). For the duration of the spell, the target may focus that enmity into increased damage and accuracy in combat: an extra 1-10 hit points of damage for every successful attack. However, all attempts to attack subjects other than that targeted by judgement's effects suffer a penalty equal to the spell’s bonuses. A nasty twist on the traditional magic missile, a netherbarb is also a floating bolt of magical energy – in this case, purplish-black and writhing. A netherbarb inflicts 1-4 hit points of damage to a living target and causes one point of Strength to be lost for two hours – but it will “heal” 1-8 hit points of damage if cast at an undead creature. Casting this spell prevents the target from casting spells or calling upon similar supernatural powers or abilities for a single round. This includes using spell scrolls or similar items, or using innate yet unnatural abilities such as a charm gaze or fire breathing. By the use of this spell, the magic-user may manipulate their shape into any other reasonably humanoid form. Weight may be shifted by as much as one-half, and extra limbs -- such as wings or additional arms -- may be grown (no more than two). No special attacks, defenses or abilities are gained despite the changes in shape. Colouration may also be changed by the use of this spell. Casting this spell sharpens the target's ability to absorb and process visual information, granting a +1 bonus to attempts to find hidden or secret doors and similar instances of cunningly-hidden things. The target's eyes develop a pale gold-green luminescence while the spell is active. Casting this spell allows the magic-user to place, undetected, a single command within the psyche of the target to be acted upon at a later time. Such a command or suggestion must be relatively simple, such as “bring the red vase to the crossroads” or “keep the outer door unlocked”, and may not be self-destructive. The command remains quiescent and undetectable until its pre-set "waiting period" elapses. The xenourge may also be implanted with a trigger word or situation instead of a flat waiting period. By casting this spell and touching an object (or a wall, in the case of a room; said room or part of a room may be no larger than 20x20’), the cleric may determine the following information about the item’s previous condition: condition, physical ownership, actual ownership, location (if applicable), and usage. Casting this spell produces a soft, melodic drone in a 20’ radius which lulls all hearing it into a half-hypnotized state, leaving them vulnerable and unable to take offensive actions. The spell affects 3d8 HD of creatures within its area of effect; victims are effectively stunned, unable to take any action, for the first round. In subsequent rounds those affected are addled but recovering, capable of defending if attacked but little else. Victims making their saves are addled in the first round and subsequently unaffected. Tifani: A small defensive construct beloved of the neu, a tifani is an orb of scintillating glass shards in a riot of colours, held in spherical shape by a delicate orichalcum frame. Some tifani are are triggered by touch (such as by being picked up), or are pre-set to trigger when a moving object comes within a certain range, or by the presence of a specific type of being. Other tifani are even equipped with tiny legs of orichalcum and bronze, waddling about like animated baubles until their trigger is met. As soon as that trigger is tripped, however, the tifani detonates in a magic-fuelled ball of glittering flame and needles of magically-hardened glass, inflicting 2-12 hit points of damage on all within a 10' radius of the exploding construct. Casting this spell creates a field of magical energy around the magic-user which halves the damage caused by magic missiles and similar effects. Once during the duration of the spell, the magic-user may create a palm-sized shimmering black orb; this orb may be thrown up to 20' and explodes with concussive force, causing 1-6 hit points of damage. The magic-user has two forms of this spell to choose from. If the combat version is used, a +2 to weapon damage is gained for one turn; if the non-combat version is chosen, the magic-user adds +4 to their Strength score for the purposes of lifting, carrying and similar activities for an hour. Casting this spell conjures a pair of curved, hinged shearing blades that can be commanded to fly up to 50' away from the magic-user. In combat the blades deal damage as a dagger, and function as a silver weapon; against plants and plant-based monsters the blades inflict an additional 2 hit points of damage. Bright and to the point, this spell produces a bolt of brilliant lightning that races towards the chosen target, inflicting 1-6 hit points of damage; the bolt also shatters metal and desiccates scale and flesh, causing the target's Armour Class to worsen by 2. This spell creates a razor-keen shard of ice that flies at a single target within range, causing 1-6 hit points of damage upon impact. Alternatively the magic-user may direct the shard against the ground, creating a slippery skin of ice up to 40 square feet in area that lasts for four rounds; any attempting to cross the ice must make a dexterity check or fall prone. Casting this spell creates two airborne flames that circle around the magic-user. Any opponent that attacks the magic-user in melee is stuck by the flames, receiving 1-2 hit points of damage. Once during the duration of the spell, the magic-user may create a third flame; this flame may be directed to 40' away and causes 1-4 hit points of damage to its target. In the falling light of evening Jie Chue found himself approached by the scion of an ancient line. This pale-haired prince desired a pair of light and shining blades, quick to blood, a hidden sting; though, cursed in his blood, could wield no steel. He asked only for wisdom. Jie Chue smiled and turned away. In the rising light of morning he gifted the prince with dawn's own lightning. The Waiting Storm: Paired shortswords, The Waiting Storm is crafted of transparent glass as strong as steel; pale gold and rose and colourless, the glass of the blades appears rippled and dimpled though is perfectly smooth and bearing a razor's edge. Though hilt and pommel are cast as one with the blades, the grip of each sword is wrapped with twisted white and jade green silks and bear a white silk tassel tipped with gold. Each of the Storm's blades holds within a bit of the power of lightning, released at the will of the wielder. Each blade of The Waiting Storm is a shortsword +1. With every successful strike, a blade will generate one hit point's worth of stored damage to a maximum of six points stored in each blade. These points may be expended as electrical damage during an attack; alternately, three points may be expended to hold a target for one hour if a save vs. paralysis is failed. By casting this spell, the magic-user cloaks themselves in a scintillating glamour that amplifies their personability. Appearing to be a more charismatic and trustworthy individual, the magic-user gains a +2 to reaction rolls for the spell's duration. By casting this spell, the magic-user binds the target's wrists (or equivalent with manacles of brilliant blue-gold flame. These manacles prevent actions requiring free use of the limbs; and every round in which the captive actively struggles the manacles constrict and flare, inflicting 1-2 hit points of damage. Fossils are unusual elementals; spirits of earth inhabiting the petrified bones of long-dead creatures. The animating force of the elemental draws the bones together again, granting it a physical body with which to travel through -- literally! -- the mundane world. The hollow eyes of a fossil shine with tiny pinpricks of gold or jade-coloured light. Despite their appearance, fossils are not undead and cannot be turned, harmed by holy water, or otherwise affected by magic or objects that affect the undead. In combat a fossil strikes with whatever natural weaponry its stony frame possesses, slamming petrified bone into its opponents when necessary. Most fossils possess a combination of “weapons” and attack in a one/one/two pattern, inflicting damage as noted for their Hit Dice above. Fossils of six and nine Hit Dice cause petrification in the bodies of their victims when they strike, effectively draining one level in a round in which the fossil successfully attacked. Fossils are immune to non-magical weapons, and to all damage from earth and cold. They take double damage from lightning-based attacks. The kiknai – commonly referred to as “frost swans” or “snow swans” – are large swan-like birds with faintly sparkling, pure white plumage, silver-grey feet and bills, and brilliant blue eyes. Native to the frozen lands, the odd kiknai may put in an appearance in warmer climes, whether as a migrant, a noble's garden ornament, or simple curiosity – as the snow swans are as intelligent as any human, and may take a human shape. In combat a kiknai will fight with whatever weapons come to hand if it wears a human form, but prefers combat in its native shape. As an avian a kiknai batters with its great wings, inflicting 1-6 hit points of damage with each strike. Every three rounds a snow swan may create a frostwave with its wings, a freezing cone of air measuring 20' long and 10' wide at its end that inflicts 4-16 hit points of damage. In human shape a kiknai usually but not always has hair of white or silver; their eyes are always brilliant blue, however, and a coolness seems to follow them. In either shape they are immune to all forms of cold. Cerastes Staff: Though ancient of design and -- like many other objects of their kind -- attributed to the neu of more temperate climes, the cerastes staff has found its greatest popularity amongst the traveling spellcasters and mystics of the Golden Reach and its desert borders. Appearing crafted of bronzewood carved with a sheath of tiny scales and bound with copper rings, when held up to the sun a cerastes staff shines transparent, like brazen glass, and reveals intricate internal clockworks of gold and adamant and garnet. Usable as a weapon, a cerastes staff is more useful still when its fangs are bared. A cerastes staff is a staff +1. As willed by the bearer of the staff, a pair of small bronze fangs or "horns" may be extended from the side of the weapon; if these horns are used to draw blood -- even a scratch will do -- the staff will negate any one poison affecting the bloodied individual. The staff will then store the poison to be used against a target by deploying the fangs once more, and will not heal again until the stored toxin is expelled. Eerie little creatures of death, sa'au resemble nothing so much as the half-crystallized, ambulatory skeletons of human infants. Empty jaws chattering like off-key chimes, sa'au prefer to attack in swarms whenever possible, overwhelming their targets with panic before they move in with tiny bone claws to pluck away bits of soulstuff. In combat sa'au attack with their hardened bony fingers and snapping jaws, inflicting 1-2 hit points per claw and 1 hit point per bite. If sa'au makes a successful bite attack it latches onto its victim, causing 1 point of Constitution to be lost every round until the creature is destroyed. This loss is recovered after four hours; if all Constitution is lost, the victim dies and a new sa'au claws free from the corpse within twenty-four hours. When first faced with an attacking swarm of sa'au, a save vs. paralyzation must be made or the wave of fear generated by the creatures causes a mental crippling; all actions against the sa'au are at -2 to all rolls until one sa'au is destroyed. Notes: Cheerful, but prone to taking sides in an argument. Third-generation daughter of beekeepers, highly knowledgeable about unusual insects and insectoid creatures. Notes: Cleric of a martial deity and considers running from a battle dishonourable. Has lost a fellow cleric to lycanthropes while a novitiate and rages over the fact; she gains a +1 to hit against such creatures. Notes: A stickler for details and the letter of the law – but, if her trust is gained, will also happily point out any available loopholes in local laws that deal with taxes, fees and other such levies of cash. Collector of old manuscripts. Notes: Flighty but not violent, save when startled or expecting the local law to come crashing down on poachers. Gets highly agitated when she is in an urban environment for longer than a night or two. Loves baby ducks. I am indeed not dead, only sleeping, as it were. For a few various reasons -- some having to do with the blogosphere, some to do with non-Interwebs events, and a great deal to do with other activities in my life at the moment -- I've not been feeling the itch to write for this neck of the woods. I haven't given up my Rules Cyclopedia by a long shot, but my attention is elsewhere. I churned out posts for the better part of a year, and I daresay I'll be back again before long. But I need other things at the moment, and there are some other things I don't need much so much of.